I filmed this about two years ago with Jack Lawrence and Robert Bowlin. A fun time was had by all. You can get it at Flatpicking Mercantile. Here’s what they say about it (and I think they’re right). In this concert performance DVD, filmed at the Peaceful Bend Americana Music Festival in Steelville, MO, Flatpicking Guitar Magazine and SimpleFolk Productions present three of the country’s most highly respected acoustic guitar players performing a very special evening of music. 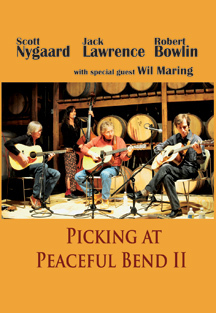 Jack Lawrence (Doc Watson’s long-time musical partner) is joined here by flatpicking veterans Scott Nygaard and Robert Bowlin. In this concert these three masters of the acoustic guitar perform as a trio, in different duo configurations, and solo. Plus singer/songwriter Wil Maring joins them as a special guest. All three of these performers have had illustrious careers that each span over three decades. It is rare opportunity to see acoustic guitarists with their combined experience and level of talent performing together in concert. Each of these guitarist have their own unique approach to the guitar. Witnessing the smooth and seamless integration of their diverse guitar styles as they bring each tune to life is both exciting and captivating. Plus this DVD includes special bonus footage featuring two of the young stars of flatpicking guitar music, Josh Williams and Tyler Grant, performing Cattle In The Cane and Nine Pound Hammer. This is a “must see” concert performance for the fan of flatpicking music. Really enjoyed it, Scott. Loved the sonic clarity of your Bourgeois as well.